The last of the Norton parallel twin machines, the Commando began life as a 750 in the late 1960s, growing into the 829cc 850. Its most interesting feature was its ingenious engine mounting system. 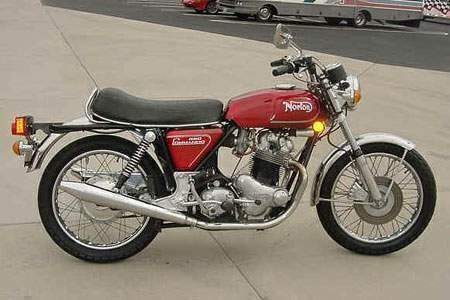 Norton had neither the time nor money to develop a new engine to take on modern superbikes like Honda's CB750, and was stuck with the parallel twin engine from the Atlas. This engine was powerful enough, but suffered from terrible vibration. Norton decided to use a system of rubber mounts between the engine and frame, while mounting the swingarm to the engine casings. This Tsolastic' mounting system kept the swingarm true in relation to the engine position, while isolating the rest of the chassis from the intrusive vibes of the engine. At a time when the world has seemingly gone mad with multicylinder candy apple monuments to engineering complexity, it is refreshing to find a manufacturer who has made good use of a simple design made excellent by attention to detail. At first glance one begins to notice the pains that are taken in the execution of a tried and proven design. The machine is not merely an attempt to keep up with the Joneses or the Sochiro's. It is the logical progression of a more rational day in which the motorcycle was used as a means of sporting transport. The engine is unmistakably Norton's, a direct descendant of the venerable "88" that began as a 500cc Twin in the late 1930's. The polished alloy covers look much the same as they did four decades ago, but this is where the similarity ends. The internals of the machine are as modern as any machine on the market today. Norton did not just stroke and poke their twin to a capacity almost twice its original size. Each component has been changed to produce an 830cc. engine with both performance, which the bike has in abundance, and also an engine with almost total reliability. Norton Villier's has done its homework well in developing a machine with both these qualities. The crank is a two piece forged unit that rides on three roller main bearings. The drive side of the assembly is supported by two large bearings which insure a safe transmission of the gobs of torque this engine produces. The rods run on plain bearings, an idea that seems to be coming back into vogue on modern super-bikes. The lower end of this engine should last a lifetime, provided the engine oil is changed at the prescribed intervals and the red line is observed. The engine, with its 89mm stroke, is decidedly long legged and peak power is achieved at 5900 rpm so there is no real advantage to spinning it to grands as is necessary with its eastern counterparts. The crankcases have been reinforced to take the power generated by the larger 850cc displacement. The big news is in the new cylinder. To gain the extra 100cc's the bore has been increased from 73mm to a size of 77mm. It is here that the boys from Andover have again followed the same logical progression by attention to detail which saved them from the financial wolves that prowl the forests of Coventry and Birmingham. Reliability has been improved while displacement has been increased by almost 15 per cent. The new cylinder is held in place by bolts which run directly into the crankcases themselves. Strength and rigidity have been increased to handle the ad-ditional inches. The pistons are standard Norton design with a three piece oil ring. The engine has been designed to give peak performance on regular grade gasoline. This should be a real boon to the touring types who wish to travel in other countries, where high octane ratings are an unknown thing. 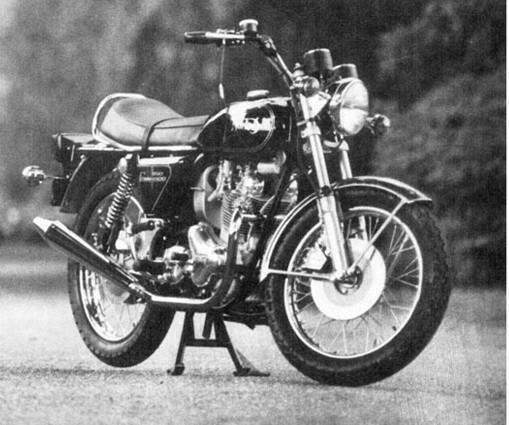 The Commando 850 retains the same cylinder head as the earlier 750's. It is well designed to allow the machine to breathe freely. Much attention has been given to the porting. It is as good as one will find on any production motorcycle. The head is the key to the Commando's performance. Again we see that attention to detail rather than engineering trickery is used to produce a machine with more than competitive performance. The Norton gearbox would be a credit to any motorcycle. The shifts are positive and there is not even a hint of gear clash, no matter how quickly the shifts are made. As with past Nortons, there is a gear indicator to show which gear is engaged. Over the years the reliability of this transmission has been proven on the road and track. A few years back most English motorcycles enjoyed the reputation that you could ride all you liked but be sure to be home by night. The new Lucas electrics are as good as any system found on any current production bike. The headlamp throws a bright wide beam that allows for safe and fast nighttime touring. There is a new tail lamp assembly with a much larger lens which should be more than sufficient for good after-dark visibility. A Lucas alternator has the chore of supplying power for the entire system and seems to be up to the job. A rectifier and zenner diode complete the system. Incorporated into the system is a capacitor for dead battery starts or the battery can be totally removed and the system will function quite well without it. Starting is a bit more difficult but full lighting and ignition are possible without aid of the battery. Turn signals are fitted to the new model as standard equipment. They are located on stalks which are long enough to be seen by even the most myopic automobile driver. The only shortcoming in the whole set up is the rather ill defined Lucas handlebar switch. It is strange to note that Lucas parts are used throughout the entire electrical system until we get to the battery, which is inscribed with the words "Norton Villers, Made In Japan." There does not seem to be any sort of rejection problems because of the departure. The bike we tested was fitted with the superb Dunlop TT100 tires. They have got to be one of the best road tires made in the world today. They cling when leaned to the limits and from past experience their wear qualities should be the equal of anything available. All in all the new 850 Commando has the credentials of a fine high speed sport touring machine. By now you're asking: "What is it like to ride?" Our test machine was supplied by YBM Cycle Sales of Bryn Mawr, Pennsylvania and much of the credit for the bike's flawless performance must go to the attention given to the machine during set-up. Thanks, Don. My first thought on seeing this machine was "Boy, this one's going to be a bugger to start." I was fooled by the label on the side of the machine which proclaims its monstrous displacement. Starting proved to require some effort on the kick start pedal, but the machine proved very willing to fire on the first or second kick. Cold starting requires a simple drill of gas on, tickle the two 32mm Amal concentrics, turn on the key, crack the throttle and step through on the kick starter. The machine comes to life with a muted rumble. There is the realization that you are on a very large displacement machine by the mellow note. Norton Villers has fitted mutes to the standard silencers and have reduced the noise level to a minimum. These mutes can be removed but realize that you can ride with more gusto on a bike that does not attract attention. The 850 vibrates quite a bit at engine speeds below 3000 rpm, but this can be all but taken away by putting a preload on the top motor mounts. This is done merely by installing the proper thickness washer under the allen screws in the top mount. This will be done by the factory on later machines but for those of you who buy an early model, your Norton dealer should have the necessary information by the time this test is printed. Above 3000 rpm the vibration dispersed and the engine takes on the character of a multi as far as smoothness. This smoothness is due to the rubber mounting of the engine in the frame. Again we see better quality control at Andover, much more attention is being paid to proper shimming of the mounts than on earlier models. A good design made better by attention to detail. When one pulls in on the clutch one notices the light pull made possible by the use of a diaphragm type pressure plate. The clutch is effortless even after a full day of riding and at no time during the test did we find any tendency towards slip or drag even under the most severe use. As we pulled away, the reasoning behind the increased displacement became apparent. How much power do you want? The throttle is like a rheostat. It's all there right from an idle. Any gear, any rpm, there is no complaint from the English twin. In traffic it's as docile as a light weight. For its size it is the lightweight. At 430 pounds it is the lightest super-bike on the market. This lightweight pays off in spades when a quick change in trajectory is necessary. On the tight back roads of Chester County the Commando excels in the handling department, which is in keeping with Norton tradition. We did note a bit of a twitch in the front end when pushing to the limits over rough roads, but for inveterate scratchers, Norton Villers markets a hydraulic dampener developed on their highly successful Manx winning production racers. On the 850 the overall gearing has been raised by the use of a 21-tooth counter shaft sprocket in conjunction with a 42-tooth rear sprocket. Chain is Mark 10 Reynolds and it showed no need for adjustment during the entire test. Highway cruising is effortless on this machine and one must be careful not to exceed the posted speed limits on even the superhighways. The 850 would pull all the way to an indicated 125 mph with a little coaxing. At any speed the machine was smooth and stable. The springing is stiff but the machine did not feel uncomfortable on most roads. There were a few shortcomings. One of these was the seat. At first I thought it was just a problem with the material used in the padding of the saddle, but then discovered that the reason for the shortcoming was the seat is only about two inches thick over the main top tube of the frame, but on a sport machine this is something to be forgiven for the fine handling made possible by the frame design. We also found that it was impossible to find a comfortable position on the right footpeg because of the kick start lever. We finally solved this problem by folding out the pedal. The brakes on the Commando were excellent and very much in keeping with the overall performance of the machine. The Lockeed-Norton front disc was smooth and required little effort to bring the machine to a safe stable halt. The input is predictable and there is little danger in locking up the front wheel. The rear drum was the perfect mate and even high speed stops were made with no panic factor at all. 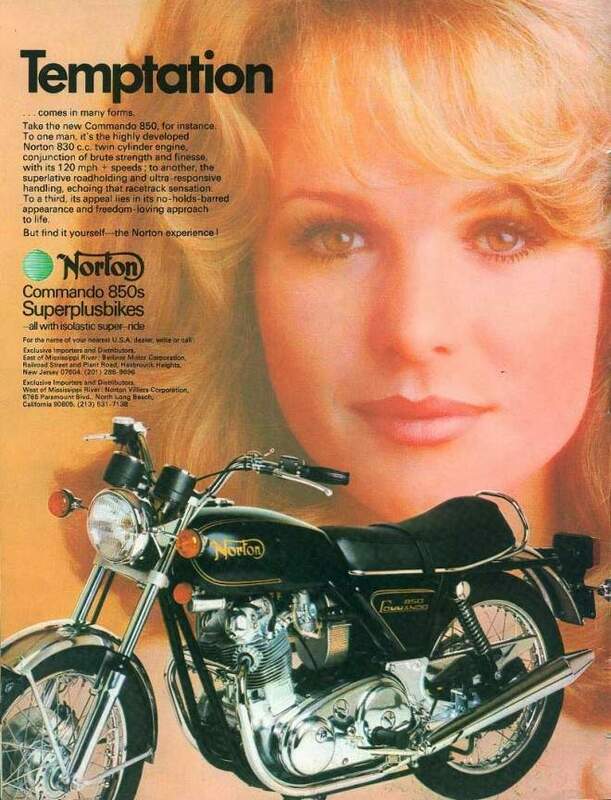 If a machine with good handling, smooth engines, mechanical simplicity and a high performance potential are your idea of what a motorcycle is all about, a Norton 850 Commando is a bike that must be taken for careful consideration. It has all those qualities in abundance.